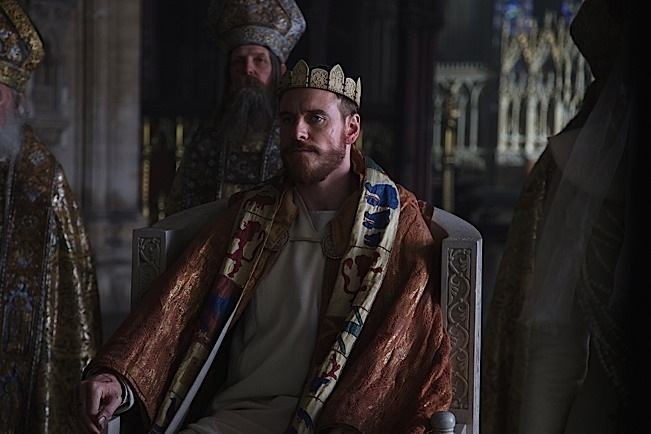 MICHAEL FASSBENDER stars in MACBETH. Photo courtesy of The Weinstein Company. Australian Justin Kurzel is clearly a gatekeeper of some of theater and film’s deepest traditions. The director has crafted one of William Shakespeare’s bloodiest plays into a dark cinematic vision accessible to general audiences while keeping the original 17th century script largely intact. Kurzel illuminates the original as the monumental work of conscience that it is, which something many stage productions lose sight of. But you feel the conscience in every single moment of the film. Those who know the play well may stubbornly cling to their fixed notions about it, though many Macbeth play fans are clearly adoring Kurzel’s work. And those who shy away from Shakespeare are bound to be amazed, actually. The incomparable Michael Fassbender embodies with magnetic reptilian masculinity as the Scottish royal whose bloodlust runs amok. His Lady is played with ineffable delicacy by Marion Cotillard in an understated performance, unique among Lady Macbeth portrayals. You may feel sorry for the character, a bold and successful choice by this superb actress. 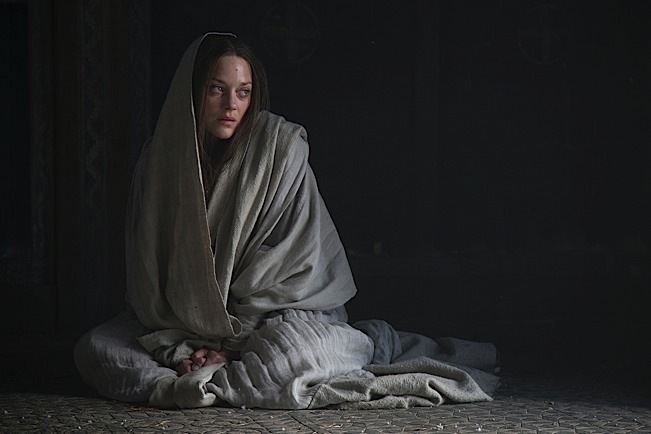 MARION COTILLARD stars in MACBETH. Photo courtesy of The Weinstein Company. Production designer Fiona Crombie and costume designer Jacqueline Durran capture the medieval setting with cryptic power. You feel the conscience-igniting power of the church imagery and dress as they seem to watch on the crimes committed. Kurzel has young children, raggedly garbed by Durran, placed at points throughout looking truly like the straggling victims of war that children actually are in wartime. This does not register as sentimental but as the crime against humanity that perhaps all of us are guilty of. As one would expect, there have already been predictably prissy comments about the fact that adapters Jacob Koskoff, Todd Louiso, and Michael Lesslie have made some line cuts, even some of the tragedy’s most memorable. But this is often done in Shakespeare stage and film productions and in this case the intentions of the original are fully honored. So get over it! That’s why the film runs only a dynamic 113 minutes. If you are a true Shakespeare lover who feels the world would be a better place if more people experienced him, then be happy about that. The more people who see this film, the better. Be happy that the violence, which is indeed graphic, does not overshadow the language; in other words, be happy that the violence doesn’t go “Tarantino” on you. Nor does Kurzel go “Peter Jackson” on you: the battle and troop images are hauntingly presented as the dreadful things they are and we must absorb it rather than “check out” into fantasy. Of course, I can just hear the complaint that the heightened language of Shakespeare, though the script is largely true to his words, is broken up so that we don’t hear the poetic rhythms exactly as they are supposedly meant to be. Indeed, this is a liberty taken but this approach matches up profoundly with the chaos that the narrative unfolds. 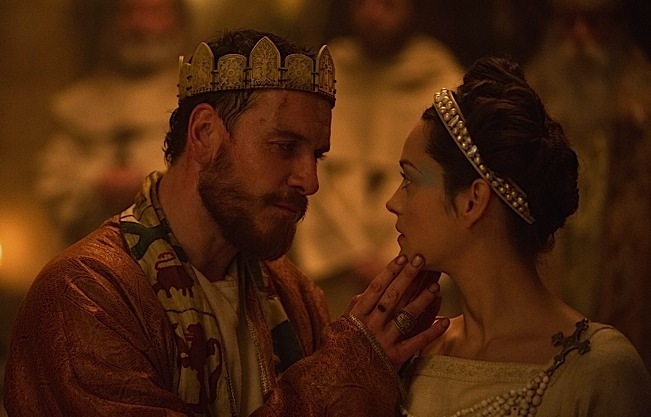 (L-R) MICHAEL FASSBENDER and MARION COTILLARD star in MACBETH. Photo courtesy of The Weinstein Company. Some uptight purists will also get bothered because they think the language is too softly spoken. Sorry to burst their bubble but that verbal delivery choice compels the viewer to tap into intuition and feel the obscenity of the characters’ actions. Kurzel’s darkly majestic vision is served by his brother Jed’s music score which adds brilliantly to Macbeth’s hypnotic power. Adam Arkapaw’s cinematography is staggering with little special effect cheating. Chris Dickens’s editing is poetry itself. Those scenes on the shore, the encampment scenes, the castle, the red and orange use of color, the three witches, etc. have the gravity, grit, and textures viscerally resonant of Soviet and Scandinavian classic cinema. You don’t have to know this to savor Macbeth’s visual beauty, just as you don’t even have to be familiar with Shakespeare to be swept away by its story. That said, those who love the likes of Andrei Tarkovsky and Ingmar Bergman will likely feel transported in a very special way. Orson Welles and Roman Polanski directed commendable Macbeths but Kurzel’s is superior to both. So don’t even dare to miss this Macbeth. In our era of “endless war” it is indispensable. PS: If the great Fassbender is Oscar-nominated for Aaron Sorkin and Danny Boyle’s shameless propaganda piece of work, Steve Jobs, instead of Macbeth, that will be my voice you’ll hear screaming across the U.S. and Canada.